It’s 8 o’clock on Saturday morning. You have a warm mug full of tea or coffee (whichever you prefer) resting in your hands while you ponder what to write. You sit down at your favorite place and stare at the blank page. If only one idea could pop into your mind. This may be the struggle for those who want to write but cannot think of anything “good enough,” or this may be a problem for writers that are completely out of “good ideas.” The first step is to get the idea of “good enough” and “good ideas” out of your mind. When thinking of ideas for a novel, it shouldn’t matter what the thought is; so long as you’re inspired, write the idea down so you can potentially work with it. Now that we’ve covered that writing down whatever pops into your head, it’s good practice to keep a good journal with you at all times. You never know when inspiration may strike. There are many ways to get ideas for your writing, but you must have the discipline to read and write every day in order to grow those ideas. First thing’s first: READ, READ, READ! All good writers get ideas from other good writers. If you think about it, there is a structure to stories: exposition, rising action, climax, falling action, and resolution. All novels have these aspects, although they don’t necessarily have to be in that order. With that being said, while reading novels (and short stories), you gain ideas for your own writing. I personally love the classics and early 20th century writers so when I begin to write, I consider how Jane Austen would start a novel or how Ernest Hemingway would develop his characters. T.S. Eliot once said, “Bad poets imitate; good poets steal.” Obviously, he didn’t mean to take someone’s idea and make it your own, but to steal the effects that made it memorable or moving. Resonate on why a passage stuck with you so much, and think of how you could create a passage just as moving. The more you read, the more you will learn how to write; the larger variety of novels, the better you will be at creating your own spin on stories. Once you’re done with all that reading, the next step is to write, all the time, every single day. Even if you’re having writer’s block, continue to write. It doesn’t need to be anything special, but as long as you are putting something down in your journal or your computer, you are keeping the habit. If you write for at least 15 minutes a day, something could pop up into your mind that you could develop. Having your ideas and thoughts written down will also make it easier to remember something jotted down two weeks ago. It might not have been a “good idea” then, but you observed something different today that correlates with that characterization you made prior. If you are having a hard time creating an idea, you could try free-writing. This involves writing down everything that comes to your mind without erasing anything. You could be writing complete nonsense but within that nonsense could be a word that strikes a memory, and then boom! You have an idea to continue exploring. Keep writing until it is a stream of consciousness, which clearly worked well for Virginia Wolfe. Along with these suggestions, when you are in a public place simply observe people. This is what everyone learns in Creative Writing 101, but it is a great idea. Characters make up the majority of a story, so it’s important to observe those around you because this could help with characterization and dialogue. Listening to an individual’s conversation could also give you an idea for a story. For example, they could say, “I really enjoyed that bowl of pasta you made last night,” and that could produce a million different topics. Perhaps it was their first date, maybe they are married, their marriage might not be going so well: the list is endless of what you could do with one simple sentence. In Writing Fiction by Janet Burroway, she talks about Dorothea Brande’s idea of getting up and writing every day. The interesting part about Brande’s idea is that she says to sit down at your desk and write as soon as you wake up in the morning. Before you have done anything else, you write. She suggests this because when you have just woken up, there is a better chance of something coming out of your subconscious. Brande says to write for about twenty to thirty minutes, but once you are finished, put the writing away and don’t look at it. Then, pick a time during the week or month when you will sit down to read through all your morning thoughts to see if there are any ideas that could be developed. Every reader and writer should subscribe to a dictionary of some kind for a daily word. My suggestion is for every word, consider how you could use that word and write a paragraph using it. Even if you already know the definition or you don’t think you would never use such a word in your own writing, still do it. You never know what sort of paragraph could result. For example, the daily word that I received was prescind, which means “to withdraw one’s attention” or “to detach for purpose of thought.” It is a verb, so I could say, “Jennifer prescinded from the conversation because it was getting out of hand…” It is also a good way to expand your vocabulary and as writers, we could all find that useful. Being a history buff and loving historical fiction I already love reading history books, but regardless of personal opinion, it’s a good idea to read about history because you can recreate something that happened and renew it. This can spark inspiration about a past event, a leader, or a group of people. Whatever it may be, your idea does not necessarily need to be historical fiction, but you could recreate a moment in time with your own twist, or base a character on a specific leader from another country. The possibilities are endless. If you enjoy writing more futuristic or fantasy novels, you could still recreate an event and explore the differences of another time period. 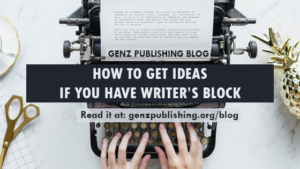 Each and every writer is different and the way they get ideas for their writing, or how they get out of writer’s block, will vary. Some people need to be in complete silence, while others require activity in order to clear their creative flow. Sometimes listening to music, watching your favorite TV show, or reading a book can help resolve writer’s block. Try different methods until you find what works best for you, and stick with it! My last suggestion for gathering ideas is to pick a time at least once a week to do your serious writing. Whatever that means for you—sitting on a bench outside, walking around your living room, or locking yourself in your room— enter your ideal creative space. Look at your notes and inspirations and pick an idea to write about or continue what you have been working on. It doesn’t matter when, where, or how, the important thing is to write. Do you have a specific method for beating writer’s block? Let us know in the comments below!